Talking getting older, Vivid and old friends. They say good things come in threes. On the new album from Sydney indie stalwarts Dappled Cities, they came in fives. The album was released on May fifth -- 5/5. It's the fifth album from the five-piece band, and their first album release in five years. Not surprisingly, they called it Five, stylised as IIIII. "It was like a beautiful chaos, everything pointing to five," Dave Rennick, the band's guitarist and vocalist, excitedly tells HuffPost Australia. "We didn't want to worry too much about what we're calling the record, we didn't want to go down a rabbit hole of metaphors or come up with something crazy. That process can be so exhausting. We were looking back at email threads from our last album, names we were throwing around, and some of these threads are 200 messages long." Dappled Cities are one of the most beloved bands on the Sydney scene, serving up four -- now five -- albums worth of groovy, trippy, strange and catchy indie-rock, blending psychedelia with classic 70s and 80s pop for an electronic-tinged sound that variously evokes the likes of the Flaming Lips, David Bowie, Grizzly Bear, Sigur Ros and Peter Gabriel. We catch Dave just a few days before the album is officially released, their first new release since 2012, and he's itching for people to hear it. The gap between 2012's Lake Air and Five is the longest the band has ever taken between records. "Every record through our career has been bigger than the previous one, and we hit a kind of terminal velocity, which exhausted us basically after [Lake Air]. We wanted to step back and take a look at ourselves, get back in touch with reality, some fresh perspective," Dave said. "All that makes it even more exciting to get this new record out. I think it marks that shift in the band." Five is a continually surprising listening experience. Opening track 'In Light Of No One' slowly fades in from silence, starting out as an easy-listening pop-rock tune in the realm of Fleetwood Mac, unfolding into a space-y rhythm with shimmering guitar lines and wailing vocals. 'Stone Men' is a groovier affair you can almost hear being dropped into DJ sets through the next season of festival and club gigs, with fat warm synths and a ripping saxophone interlude. 'Coraline' is a more direct, straight-up indie rock favourite, a rollicking drumbeat and sunny melody lifting the tune to be one that could easily soundtrack summer roadtrips or beach holidays. 'What Is Impossible' could have ended up on the latest Tame Impala record, subtle vocal harmonies and a lolling drumbeat entwining with warped retro electronics. Dave says the wide-ranging album is a product of Dappled Cities' long, luxurious break between records, which included marriages and babies for various members. "We're so much calmer, just calmer humans now. Going into recording, we were in a very content, happy and friendly place. What it results in, is this lack of desperation to reach an arbitrary checkpoint purely in your mind," he explained. "We let whatever happened, happen. We didn't stress about getting every single idea down on tape, we were more content to leave a whole lot of things off and the result is a very spacious record. There's lots of negative space, calm warm tones, long linear song structures, long outros and so on." Part of the approach, as well, was appreciating getting a little older. "When you're young, in your 20s, there's that feeling you have that time is ticking. When you hit a level of maturity, you find time isn't ticking and was never ticking. That kind of dawned on us," Dave said. To launch the album, Dappled Cities will play a special show as part of the Vivid festival in Sydney in June, as well as drawing fellow Sydney indie heroes Red Riders out of retirement to join them on the road in other cities. "Dappled has always been better live than recorded. As we should be too, we're a band," Dave said. "But certainly the Vivid show, that's something we're very much looking forward to. It's next level, being able to play at such a beautiful venue. We've got a hectic lighting visual experience in the works, the whole production is something new and exciting for us as well." "With Red Riders, we couldn't help ourselves. They were doing a little reformation show a few months ago, it was too perfect not to see if they'd come with us on tour. It's a bit of nostalgia, we're good friends and we want our mates on this tour. We want to have fun again. We don't want to stress too much, just have good souls around." IIIII is out now. 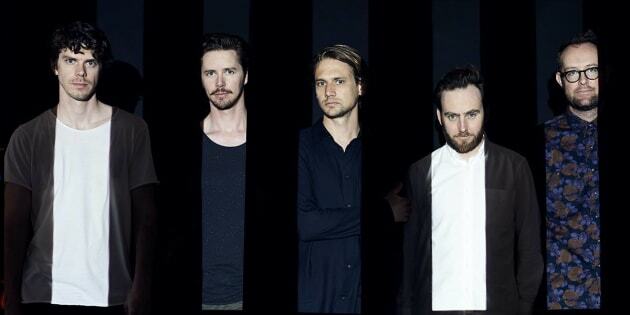 Dappled Cities play at Sydney's City Recital Hall on June 4.